I fondly remember one meal in particular. When I was 15, I was traveling in Europe as part of a troop of Boy Scouts. One day, when I was in Luzern, Switzerland, my older brother, who was serving in the U.S. Army in Southern Germany at the time, came to visit me. We jumped on the first milk train leaving the station and got off about an hour later in a village called Goshen. It was about lunch time so we climbed a small hill to a restaurant. There we sat outside, in the garden, in the shadow of the Alps eating Swiss-style bratwurst covered with a brown sauce and accompanied by fried potatoes. We washed this down with a Swiss pilsner while a chicken pecked in the gravel near our feet. It was a meal that was over much too quickly, and one that I still remember well, 37 years later. 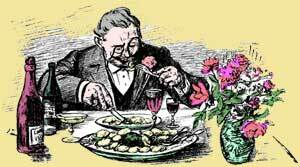 Since then, Ive even learned how to make my own sausages at home - stuffing combinations of beef, pork, chicken, veal, and duck into the former intestines of hogs or sheep. Sometimes the forcemeat is ground, sometimes it is puréed. Some sausages are served fresh and some are poached as part of the preparation. But, Ive never learned how to make smoked sausages and I dont have the facility for preparing dried ones. In May, my sausage experience took a sharp turn - a turn to the sea - or should I say seafood. Now this wasnt the first time I had been exposed to seafood sausage. 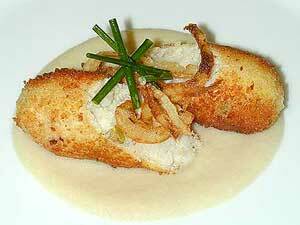 Years ago, I learned how to make seafood sausage at a course at the California Culinary Academy. Unfortunately, these were barely edible at the course and not any better when I attempted them at home. Ive seen similar recipes in various sausage cook books. It seems that each book has one token seafood sausage recipe. The problem with seafood sausages is that usually they are dry. In meat sausage, the fat content is usually between 25% and 50%. The fat provides both flavor and mouth feel to the sausage. Eating lean sausages is usually like eating cooked, flavored cardboard. In the past, the seafood sausage I had eaten tasted like overcooked fish stuffed into a piece of hog intestine. That changed in May. The remainder of the recipe - the bread crumbs, the sauce and the garnish was transmitted verbally in a couple of sentences. One problem with this recipe is that merlan, a fish similar to whiting, and langoustines, a crustacean similar to Dublin Bay prawns, are generally not available in California. Another problem with this recipe is that it produces more than 23 pounds of forcemeat - enough for 150 portions! Since my return from Amondans, Ive spent considerable time developing a version of the recipe that can be prepared for four guests. The following is the result of my efforts. This is not a recipe that can be thrown together at the last minute. The bread is baked three or four days in advance so it has a chance to dry. The sausages, except for the final preparation for service, are prepared one day in advance. The shallots for the sauce may be prepared a day in advance to simplify the work required at the last minute. Because of all the preliminary work required, the recipe has been broken into a number of parts which can be reached by clicking on the appropriate links. The recipe may appear to be a lot of work for four or five bites of sausage served during an appetizer (entrée) course, but your guests will appreciate the effort. Youll like it, too. Traditionally, cervelas in France were sausages made from pigs brains, or cervelle - thus the name. Nowadays, it is not uncommon to find versions of cervelas made from other parts of the pig. 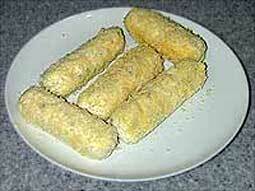 The term cervelas in this recipe refers to the shape of the sausage - not the forcemeat. 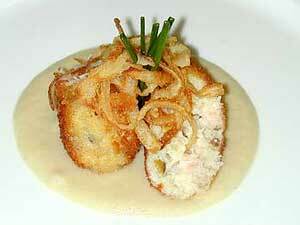 In fact, the forcemeat is really a seafood mousseline shaped like a sausage. 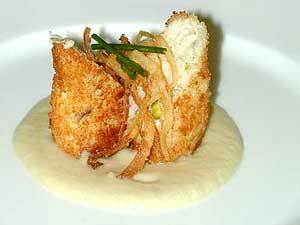 Trim the crust from the pain de mie and process the bread in a food processor until uniform crumbs are produced. The bread needs to be dry, but not rock hard. 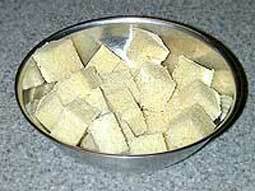 I usually will cut the bread into 2-1/2 cm (1") cubes before processing. If the bread is too soft, I let it sit out on the counter for a few hours before I make the crumbs. Place the crumbs in a shallow dish and the beaten egg in another. Carefully unwrap the chilled sausages and dry, if necessary, on absorbent paper. 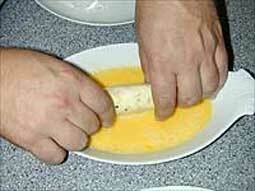 Dip each sausage, in order, in the beaten egg. 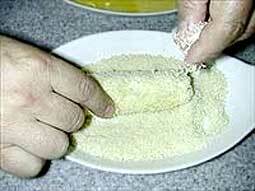 Allow the excess to drain off, and then generously coat each sausage with bread crumbs. Shake off any excess crumbs. Set the sausages aside on a plate until the oil is ready. The sausage can be coated an hour or so in advance and kept in the refrigerator until needed. Fill a large, non-stick sauté pan with oil to a depth of 3 mm (1/8") deep and place the pan over medium heat. Gently sauté sausages until golden on all sides. Drain each sausage on absorbent paper. They may be keep warm in a 75°C (170°F, thermostat 2-3) oven for up to an hour. The serving plates can be warmed in the same oven. Place 2 tablespoons of sauce in the center of each serving plate and spread it into a 10 cm (4") circle. Cut each sausage into two, with a serrated knife, on the diagonal. Arrange two sausage halves on top of sauce. Garnish each pair with a few fried onions and four or five pieces of chive. No matter how you arrange the sausages, be sure to serve them immediately. This recipe will produce 4 or 5 servings. This article comes from the web site of Peter Hertzmann, called à la carte. This is one of the finest web sites I have come across. Whilst most of us are keen amateurs who love to dabble, Peter is truly dedicated to the pursuit of his interest in and love of cooking. If his web site was to be published as a book I would be first in line to buy a copy! "Im obsessive. All my life, when something interested me, I became obsessed with it. I learned all I could about it. I lived it! . . . Ive been obsessive about food as long as I can remember. I am now obsessive with French cookery - its preparation, materials, history, politics, and culture".